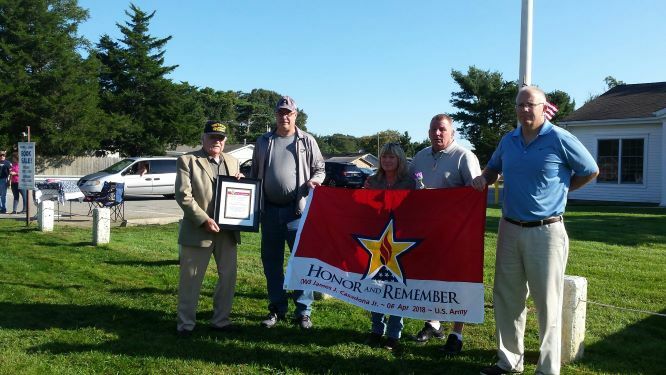 The AUSA Monmouth Chapter was very proud to support and participate in the 2018 New Jersey Run For the Fallen (NJRFTF) to Honor the 260 New Jersey Service Men and Women who died during the many Operations waged against the Global War on Terror: Iraqi Freedom, Enduring Freedom, New Dawn, Inherent Resolve, Active Endeavor and Resolute Support/Freedom's Sentinal. 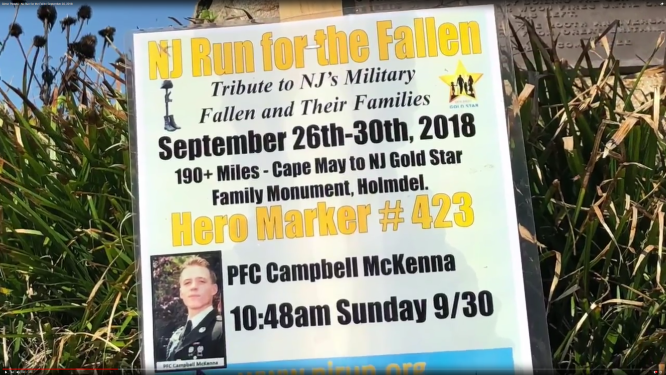 Runners embarked on 27 Sep 2018 on a 4 day, 190+ mile journey from Cape May, NJ and on 30 Sep 2018 arrived at the Finish Line, the New Jersey Vietnam Veterans Memorial, Holmdel, NJ, to honor every New Jersey service member who died supporting the Global War on Terror. During 28-30 Sep 2018, nine (9) Monmouth Chapter Board Members (COL (R) Samuel Fuoco, President; Mrs Kit Roache, VP Programs; Mrs Ellie Smith, Secretary; Mr Glenn Parada, Treasurer; Mrs Cynthia Wallace, VP Awards; Mr Charles Seal, Newsletter Editor; Mr Jan Moren; Ms Leslie Zier Ross and Mr Paul Stevens) visited the Hero Marker (HM) sites to honor the following twelve (12) Fallen Heroes: HM217 SGT Trista Moretti, HM309 PFC Stephen Benish, HM310.5 WO James Casadonas, HR411 SFC Mihail Golin, HM422 SPC Carlos Gonzalez, HM423 PFC Campbell McKenna, HM430 SGT Richard Cummings, HM445 MG Harold Greene, HM451 SGT Coleman Bean, HM457 LT Dennis Zilinski, HM462 SSG David Cook and HM464 CPT James Gurbisz.